Summertime is synonymous with BBQs. 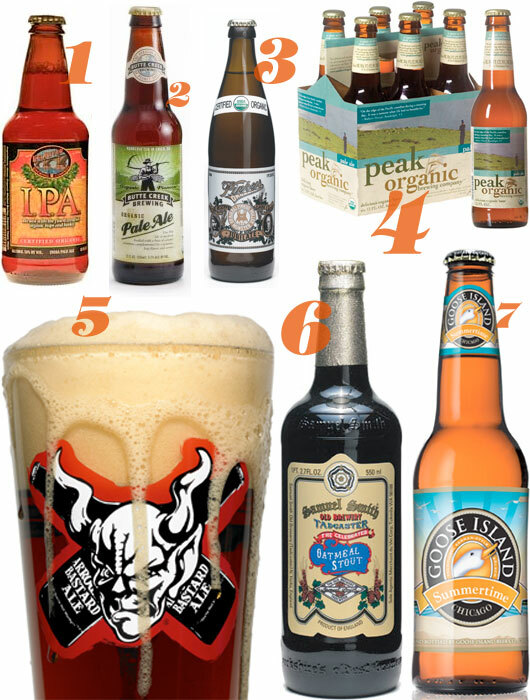 Here are seven great organic, vegan-friendly* beers to serve at your next cookout. What makes most beers (and wines) not vegan friendly? If a manufacturer can add some part of an animal into something, chances are they will. Most beer is commonly fined using isinglass, a substance obtained from the dried swim bladders of fish. Gross, and bad news for very strict vegans! On the upside, many bottled beers and most lagers are vegan. On the downside, Guinness is never suitable for strict vegans and most wines are clarified after fermentation with isinglass, edible gelatins (made from bones), casein and potassium caseinate (milk proteins) and animal albumin (egg albumin and dried blood powder). If you are a strict vegan, or plan to become one, check with Barnivore, an excellent resource for vegan wine and spirits, as well as individual brewing companies themselves to determine if your favorite drinks are produced using animal-derived ingredients. *Beers have been determined vegan-friendly via Barnivore. Extra-concerned herbivores can double-check the Barnivore site or e-mail the brewing companies to ensure that each brew is still currently 100% vegan-friendly.